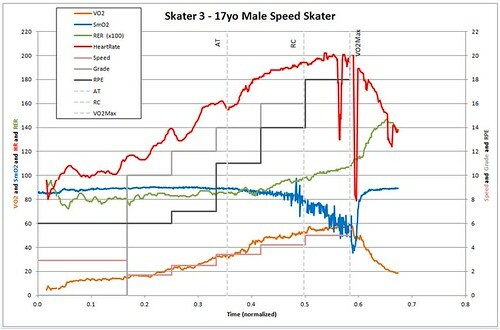 Notice how this Speed Skater is able to delay the entry into the Aerobic Zone as indicated by the steady SmO2 levels far into the exercise. This athlete is efficient at using Oxygen as an energy source. Also note how the HR changes along with the change in workout intensity and spikes at the onset, and also the obvious missed readings near VO2 Max. The SmO2 displays a sharp change in slope, very near the athlete’s entry into the Anaerobic Zone, past the RC. Great example. This looks like the SmO2 break point concept that is discussed in Ann Snyder's paper where the change in slope of the SmO2 during increasing exercise load corresponded with the lactate threshold. (The paper referred to it as StO2 rather than SmO2). Here's a link to the abstract of that paper.